You can grab the source code of the Singularity OS RDK - a Microsoft Research project from codeplex (Microsoft's version of SourceForge for Open Source Projects Hosting). It's basically an OS written mostly in managed code. It also uses a microkernel. Running the thing is pretty simple. 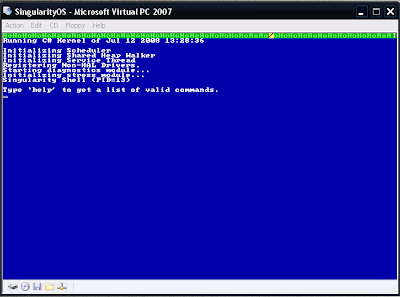 Just build world and run the ISO in VirtualPC. SedTris - a Tetris game written in sed.